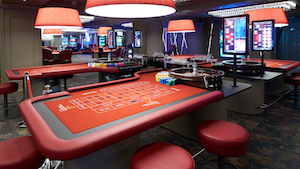 Century Casino Bath recently celebrated its grand opening, with TCS John Huxley chosen to supply the new three-floor casino with a host of live gaming products. Representing the first UK operation for Century Casinos, the new location features a 15,000sq.ft gaming floor, with 19 gaming tables and a mix of 50 slot machines and electronic gaming terminals, as well as three bars and a lounge area. TCS John Huxley provided 19 live gaming tables, 11 Saturn Roulette Wheels and one Saturn Auto wheel, 12 of the latest e-FX Displays, six Chipper Champ 2’s, four A Plus Shufflers and various table accessories.